The elaborate title pages of eighteenth-century publications served to attract the bourgeois market as much as to honor the dedicatee. Stripped of the music behind it, the title page remains a nostalgic reminiscence of an era of class. 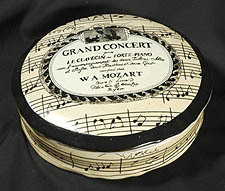 Mozart Grand Concert Porcelain Box.